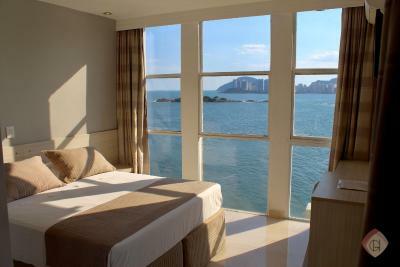 Lock in a great price for Grand Hotel Guarujá – rated 8.9 by recent guests! The location is perfect and the view from the room is spectacular. Breakfast was great. Great split AC, good bed, everything looking newly remodeled, friendly staff, good room service. The hotel was fantastic. 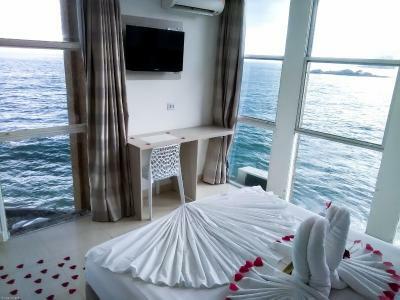 The room has a great view over the sea. The working team of the hotel were very polite. Very nice hotel, high quality staff team. Really nice family hotel. Thank you, staff of the grand hotel!! We enjoyed our stay!! 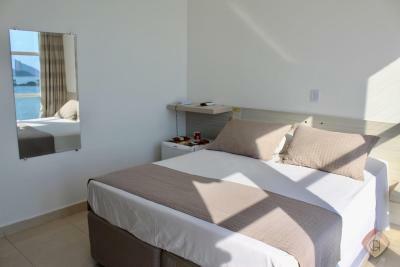 We will recommend the grand hotel to everyone who wants to go to Guaraju! Wonderful sea view. 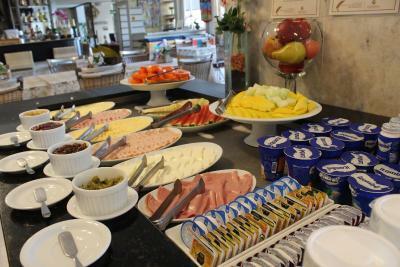 Very good breakfast with friendly staff. Modern room with a good bed and big pillows. Window can be opened to enjoy the sea view even more. Pick up your beach towel at the reception and people at the beach arrange the chairs, parasol and a table for you. Ótima localização! Funcionários super qualificados em atendimento ao cliente! O café da manhã é bom, bem servido. A cama macia e confortável, e a água da ficha é perfeita. Beachfront to Pitangueiras Beach and just a 5-minute walk from Praia da Enseada Beach, Grand Hotel Guarujá features air-conditioned rooms, 24-hour front desk and free WiFi in the public areas. The city center of Guarujá is a 10-minute walk away. The classic-style rooms feature a mini-bar and flat-screen TV with cable channels. Some of them also boast sea views. The private bathroom is equipped with a shower. Bed linen and towels are offered. Guests can have a drink at the on-site bar. 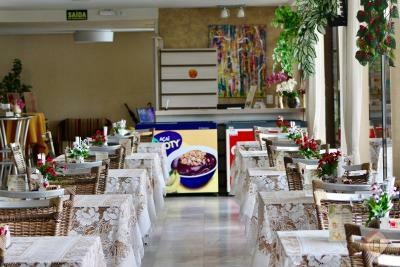 A number of dining options is a short walk away. 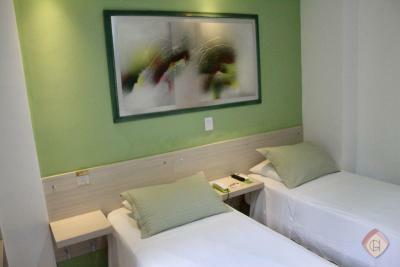 Grand Hotel Guarujá is 1.9 mi from Guarujá Bus Station and 57 mi from Congonhas International Airport. Aqua Mundo is a 10-minute drive away. 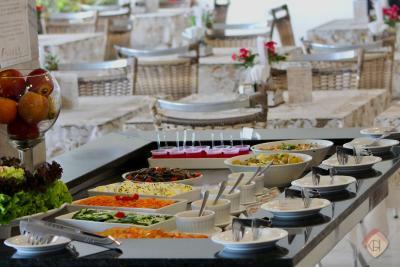 When would you like to stay at Grand Hotel Guarujá? This double air-conditioned room features a mini-bar and flat-screen TV with cable channels. The private bathroom is equipped with a shower. Bed linen and towels are offered. Please note, the shower stall is narrow and this room does not have sea view. This triple room features sea views and features air conditioning, a flat-screen TV with cable channels, a mini-bar and a private bathroom fitted with a shower. Extras include a hairdryer. Bed linen and towels are offered. This triple room features air conditioning, a flat-screen TV with cable channels, a mini-bar and a private bathroom fitted with a shower. Bed linen and towels are offered. Boasting sea views, this double room features air conditioning, a flat-screen TV with cable channels, a mini-bar and a private bathroom fitted with a shower. Extras include a hairdryer. Bed linen and towels are offered. This smaller double room features air conditioning, a flat-screen TV with cable channels,a mini-bar and a private bathroom. Bed linen and towels are offered. Please note that the shower area is narrow and this room does not offer a sea view. Boasting sea views, this double room offers accommodations for guests with disabilities, a mini-bar, air conditioning, a flat-screen TV with cable channels and a private bathroom. Bed linen and towels are offered. Hotel surroundings – This neighborhood is a great choice for travelers interested in family-friendly trips, beach walks and sandy beaches – Check location Excellent location – show map Guests loved walking around the neighborhood! 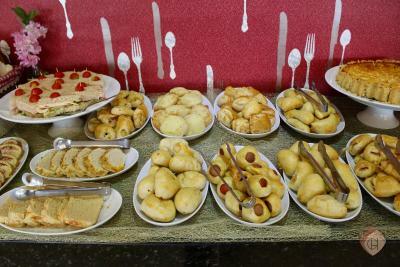 House Rules Grand Hotel Guarujá takes special requests – add in the next step! Grand Hotel Guarujá accepts these cards and reserves the right to temporarily hold an amount prior to arrival. Please note that property does not offer parking, pool or entertainment area. Please note that the property charges incidentals costs subject to a damage inspection of the accommodations upon check-out. Please note that the free WiFi is only available in the public areas of the hotel. Please note that beach services are offered by a third-party provider. Charges apply. We liked everything. Staff was wonderful. Old mattress, the restaurant does not open for dinner (only weekends), the staff are rude. You can hear the waves in your room, that's nice. Unfortunately you also hear the noise from the street. It's a street with a death end so it's not a busy street.